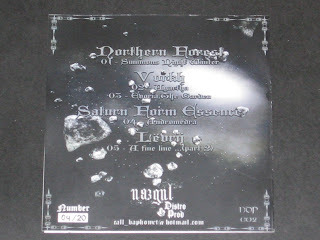 Format: Four-way split CDr and tape release from 2010. The CDr pressing was released on the Nazgul Productions & Distro label (Brazil), cat ref NDP002, and the tape on Bosque Produções label (Brazil), the latter label run by Kevera of Northern Forest. This four-way split release brings together an interesting variety of bands from around the globe, revealing some memorable dark ambient soundscapes within its 27 minute duration. 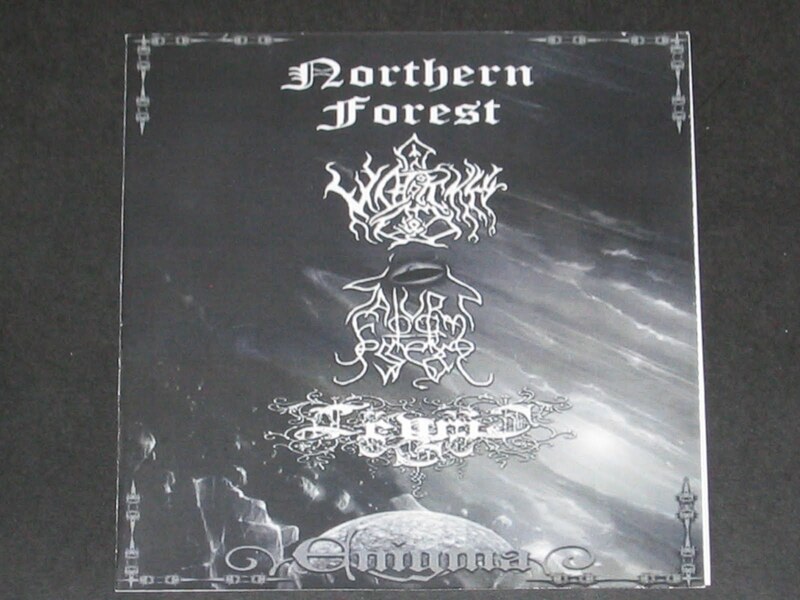 Northern Forest (ironically from the southern forests of Manaus, Brazil) have been around since 2008 and in recent years have put forth a positive deluge of demos in their dark ambient / black metal fuelled attack, covering in their misanthropic lyrics the themes of the seasons, nature, landscapes, and the night-time. I confess to knowing little about fellow Brazilian band Vorkh (save that they managed to sneak two songs onto this release), or Argentinian horde Levrij, but between all three of these bands a splendid racket is created that combines some atmospheric twists and turns with some creative drumming (a pleasant change from the overdone blast-beats too many bands employ) and interesting ambient sections in amidst the hate. Saturn Form Essence pitch up with the track 'Andromeda' or, to give it its full title, 'Galaxy M31: Andromeda'. Originally released in unusual packaging back in February 2010 (a format that has so far eluded my collection), this track has popped up here and there across other releases - the "Cosmogony" split with Ablaze Eternal being another - and is something of a minor classic of recent SFE recordings. Varied instrumentation - more so than, say, many of the very ambient , ethereal solar-wind style SFE releases can be - gives this song more groove than other tracks from this Ukrainian project, and with that comes a more rounded listening experience. It's still very quiet in places: great, in as far as it conveys the vastness of space, less great if you're attempting to review the song whilst listening to the CD in the car though! And what do we know of Galaxy M31 itself, after which this song is named? Also known as Messier 31 or NGC 224, and occasionally referred to as the Great Andromeda Nebula, Andromeda was formed out of the collision of two smaller galaxies between 5 and 9 billion years ago. It is a spiral galaxy approximately 2.5 million light-years from Earth in the constellation Andromeda, named after the mythological princess. You will doubtless recall from your education in the Classics that Andromeda, as divine punishment for her mother's bragging (the 'Boast of Cassiopeia') was chained to a rock as a sacrifice to a sea monster. She was saved from death by Perseus, her future husband. Andromeda is the nearest spiral galaxy to the Milky Way, but not the closest galaxy overall. The 2006 observations by the Spitzer Space Telescope revealed that M31 contains one trillion (1012) stars, more than the number of stars in our own galaxy, estimated to be around 200-400 billion in total. Neither total comes close to the number of demos from Austrian musician Hugin that have been amassed by the infamous Nazgul, however, secreted away in his Castle in the stars beyond the edge of the universe (left at the roundabout, straight on past the fish and chip shop). Interestingly the Andromeda Galaxy and the Milky Way are thus expected to collide in about 4.5 billion years, although the details are uncertain since Andromeda's tangential velocity with respect to the Milky Way is only known to within about a factor of two. A likely outcome of the collision is that the galaxies will merge to form a giant elliptical galaxy. If the galaxies do not merge, there is a small chance that the Solar System could be ejected from the Milky Way or join Andromeda. The fate of the Earth and the Solar System in the event of a collision are currently unknown, so if you have pressing business to attend to in 4.5 billion years from now I'd suggest getting your affairs in order sooner rather than later. Did you also know that Andromeda has featured regularly in sci-fi films and books over the years? In the novel 'Voyage of the Space Beagle' by A.E. Van Vogt for example, the starship (Space Beagle) is sent out by Earth to investigate alien life forms. When it reaches the Andromeda Galaxy, it encounters an enormous disembodied life form called S. - no, wait, called The Anabis - that covers the entire galaxy. The Anabis turns planets into jungle planets because it lives off the life force of living beings when they die and jungle planets have the highest rate of 'ecological energetics'. Since "The Anabis" has destroyed civilized planets in this way, the crew of the starship devises a way to defeat this being. All of which is very interesting but has little bearing on the grim musical machinations generated on this release. Sadly there seems to be no internet coverage of the demo worth shaking a stick at, so you're stuck with me for the last word on this particular release.